1) Has the person met both my fiancé and me? 2) Will the person be a part of the next chapter in my life that includes my fiancé? 3) (If a relative) Have I seen or spoken to this relative in the last three years? 4) (If a plus one) Is the couple married, engaged, or living together? With these questions, we were able to successfully whittle down our list from 180 to 130. But what happens if after asking all of those questions, you still end up with a list that’s longer than your agreed upon guest count? That’s exactly what happened to us! After asking those questions above, there were still 15 more people that we REALLY wanted to invite. The hard fact, though, was that we couldn't afford to. This is where the B-list usually comes in. A B-list is a list of friends and family that almost made the cut (The A-list), but that you simply don’t have enough space for, so you create a secondary list of wedding invitees that you’ll pull from if any of your A-list invitees decline attendance. Thankfully my wise future mother-in-law gave me one piece of advice – “don’t have a B-List”. This may seem like a simple piece of advice, but it’s been immeasurable. It’s actually quite easy to fall into this pit of B-lists & C-lists especially when you are trying to limit your guest count to a smaller number. But additional lists can mean death to your budget. I’m pretty sure any bride can tell you that the guest count always has a way of expanding naturally – think unexpected plus ones, recently engaged couples, and long-lost relatives. So the Savvy thing to do would be save any guest spots that open for those unexpected guests. Trust Me! I can’t deny how hard it was to not invite persons that Keith and I truly love; but we made the choice to dig a little deeper, ask those above questions a little more critically, and finally end with a invite list of 115. This hard decision has truly paid off! Having a smaller invite list does not change the fact that there are so many that we’d love to share our celebration with. So, we have had to think creatively on how to still include others in the celebration of our union, and our families have been so supportive. My family threw a wedding shower for me back in NC so that Keith and I could celebrate and fellowship with my friends and family from childhood. Keith’s parents are also throwing a reception for us in NJ so that we can share our union with Keith’s church family. My bridal party is hosting a shower for me in DC that is allowing me to celebrate with more friends and co-workers. Keith and I are also inviting many of our friends to a casual brunch downtown the day after the wedding so that we can truly celebrate with everyone without feeling constricted by our budget. These are just our ideas. I hope this is helpful to you? How are you creating and managing your guest list? 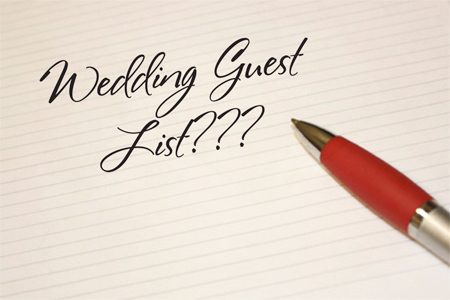 What challenges are you facing with your guest list? Tiffany Nicole is a bride blogger who got married in 2015. You can read her wedding planning posts here.